Heat a couple splashes of olive in a large pot of dutch oven over medium heat. Add the leeks, carrots, and celery, along with some salt and pepper (to taste). Cook, stirring occasionally, until the vegetables are just starting to soften, about 10 minutes. Then add the garlic, and cook for another 2 minutes, stirring a few times. Next, add the beans, 2 cups of broth, fresh thyme and rosemary, bay leaf, ground thyme, and diced tomatoes along with all their juices. Stir to combine, and simmer covered over medium-low heat for 30-40 minutes, stirring occasionally, until the vegetable are soft and tender, and the cassoulet is rich and thick. If at any point you feel that the cassoulet is drying out, add some more both. However, the cassoulet should be very thick—not watery or even with a soup-like consistency. Remove the bay leaf and taste for seasonings, and season with salt and pepper (to taste). 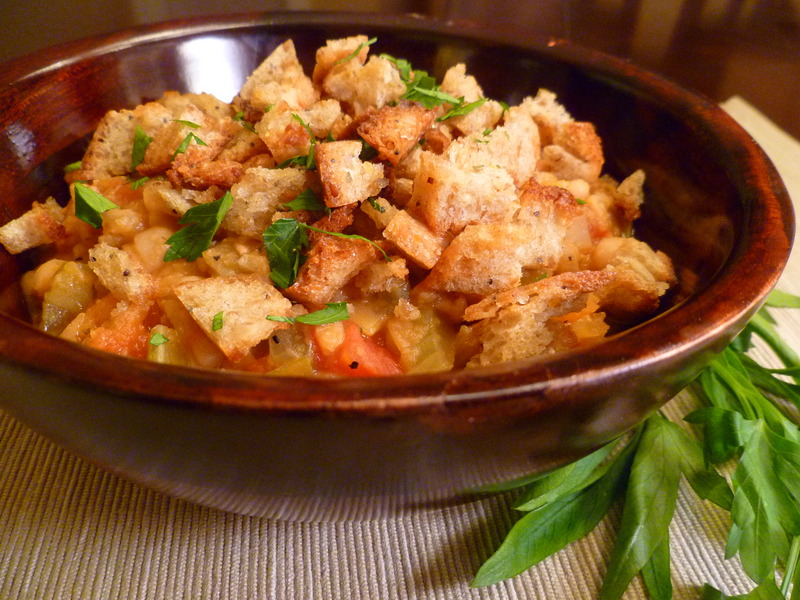 While the cassoulet is simmering away, make your breadcrumbs. Tear the baguette into pieces, and toss in a food processor. Process until coarse crumbs are formed then lay out about 3-4 cups of the crumbs on a large rimmed baking sheet and reserve the remaining breadcrumbs for another use. Melt 2 tablespoons of butter and drizzle over breadcrumbs, along with a pinch of salt. Toss the crumbs until they are lightly coated in the butter. Place under the broiler for 2-3 minutes, tossing them once or twice with a spatula, until golden brown. Set aside. Divide the cassoulet among bowls. Top with a handful of breadcrumbs and fresh, chopped parsley leaves. Enjoy by a warm fire! This looks so delicious and hearty! I love all the veggies! Kinenchen, this and the crustless potpie are great “turkey dinner” substitutes. I hope you enjoy!